They’ve done it again. The team at Automattic have created a great new default theme for this year’s release of WordPress 3.4, Twenty Twelve. It’s an extremely well designed and well-written theme that incorporates great responsive design, an attractive, text-focused approach, and good best practices. I’ve been waiting to use it on my site since it was announced, and now that it is available in the WordPress.org Theme Repository I have been playing with it. Of course that means that I need to add all of my Schema.org microdata enhancements back in–I can’t go from having all of that embedded, machine readable data to having nothing! So I applied the same techniques as I did for the previously released Twenty Eleven Schema.org child to this year’s theme, and it is ready for public consumption. 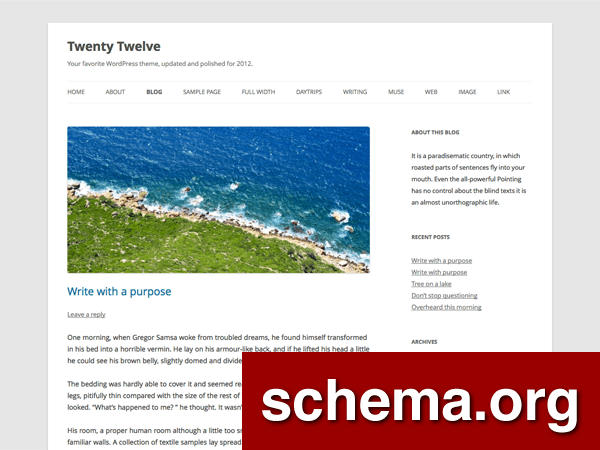 So if you are using the new Twenty Twelve theme and would like to add this microdata to your site, then feel free to download and install the T12 Schema.org child theme on your blog. You can find a download, as well as a link to the source on GitHub, on the Twenty Twelve Schema.org Child Theme dedicated page. Enjoy, and let me know how you are using it! Since blog commenting isn’t as dominant as social media shares these days I thought I would buck the trend and leave a comment. I’ve looked at the dedicated page you have up for your theme and just for the sake of scan-ability I would suggest you include a list above the example detailing the microformats that you are implementing into the code. For me – as a developer – it was no problem looking at the code: seeing the changes you made and then understanding the use of each edit but even I had trouble ‘picking out’ the edits at a glance. FYI I didn’t congratulate you on beating me to this lol I notice on the dedicated page you’ve had a few compliments and even suggested that one user forks this on github. I think I may also do that and see what we can all come up with as a collective. WordPress, after all, is one huge collaboration. Thanks William, glad you find it helpful. Definitely fork it, and when you come up with great additions, issue a pull request or open an issue. As for denoting which formats have been added, it’s pretty singular. I have only added generic Schema.org markup to the code, so I haven’t been implementing a variety of different formats. Just the one (hence the title). Also, because of that, my target really isn’t the casual WordPress user–I really am targeting more of the developer crowd, mostly because I don’t have the time to support all the casual user questions that come along with it. However, the suggestion is still good, and I’ll see if I can’t make it a little more apparent what is going on. Ahh I get it. Microformats are not something I generally consider my specialty, far from it actually – copy and paste was the way I used them previously lol. I’m not one for turning down free information tho so I looked over the pages again. I hadn’t noticed that you’d only used the one type. I noted the numerous different tags like ‘time’, ‘person’ ect. and assumed that they were different things but after your comment (and a much needed re-read!) I understand that they are all part of the one sort of structured mark-up. Good call targeting this to the developers because I have just learned a wealth of new, highly important, information that will improve my websites. I’m seeing semantic structures appear in things that I had never even thought of organizing before now.